Blue-eyed Central Asian monk teaching East-Asian monk. 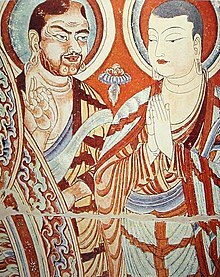 A fresco from the Bezeklik Thousand Buddha Caves, dated to the 9th century; although Albert von Le Coq (1913) assumed the blue-eyed, red-haired monk was a Tocharian, modern scholarship has identified similar Caucasian figures of the same cave temple (No. 9) as ethnic Sogdians, an Eastern Iranian people who inhabited Turfan as an ethnic minority community during the phases of Tang Chinese (7th-8th century) and Uyghur rule (9th-13th century). Buddhism entered Han China via the Silk Road, beginning in the 1st or 2nd century CE. The first documented translation efforts by Buddhist monks in China (all foreigners) were in the 2nd century CE under the influence of the expansion of the Kushan Empire into the Chinese territory of the Tarim Basin under Kanishka. These contacts brought Gandharan Buddhist culture into territories adjacent to China proper. Direct contact between Central Asian and Chinese Buddhism continued throughout the 3rd to 7th century, well into the Tang period. From the 4th century onward, with Faxian's pilgrimage to India (395–414), and later Xuanzang (629–644), Chinese pilgrims started to travel by themselves to northern India, their source of Buddhism, in order to get improved access to original scriptures. Much of the land route connecting northern India (mainly Gandhara) with China at that time was ruled by the Kushan Empire, and later the Hephthalite Empire. The Indian form of Buddhist tantra (Vajrayana) reached China in the 7th century. Tibetan Buddhism was likewise established as a branch of Vajrayana, in the 8th century. But from about this time, the Silk Road transmission of Buddhism began to decline with the Muslim conquest of Transoxiana, resulting in the Uyghur Khaganate by the 740s. By this time, Indian Buddhism itself was in decline, due to the resurgence of Hinduism on one hand and due to the Muslim expansion on the other, while Tang-era Chinese Buddhism was repressed in the 9th century, but not before in its turn giving rise to Korean and Japanese traditions. 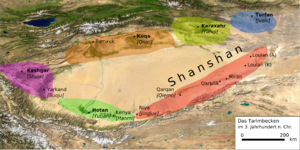 Kingdoms in the Tarim Basin during the 3rd century, connecting the territory of China with that of the Kushan Empire: Kashgar, Kucha, Khotan, Karasahr, Shanshan, Turfan. Buddhism was brought to China via the Silk Road. Buddhist monks travelled with merchant caravans on the Silk Road, to preach their new religion. The lucrative Chinese silk trade along this trade route began during the Han Dynasty (206 BCE – 220 CE) with the establishment by Alexander the Great of a system of Hellenistic kingdoms (323 BC - 63 BC) and trade networks extending from the Mediterranean to modern Afghanistan and Tajikistan on the borders of China. The powerful Greco-Bactrian Kingdoms (250 BC-125 BC) in Afghanistan and the later Indo-Greek Kingdoms (180 BC - 10 CE) practiced Greco-Buddhism and formed the first stop on the Silk Road, after China, for nearly 300 years. See Dayuan (Ta-yuan; Chinese: 大宛; literarily "Great Ionians"). It may be assumed that travelers or pilgrims brought Buddhism along the Silk Roads, but whether this first occurred from the earliest period when those roads were open, ca. 100 BC, must remain open to question. The earliest direct references to Buddhism concern the 1st century AD, but they include hagiographical elements and are not necessarily reliable or accurate. Extensive contacts however started in the 2nd century CE, probably as a consequence of the expansion of the Greco-Buddhist Kushan Empire into the Chinese territory of the Tarim Basin, with the missionary efforts of a great number of Central Asian Buddhist monks to Chinese lands. The first missionaries and translators of Buddhists scriptures into Chinese were either Parthian, Kushan, Sogdian or Kuchean. Bodhisattva mural. Chinese work showing Central Asian influence. Mogao Caves, China. In the middle of the 2nd century, the Kushan Empire under king Kaniṣka from its capital at Purushapura (modern Peshawar), India expanded into Central Asia and went beyond the regions of Kashgar, Khotan and Yarkand, in the Tarim Basin, modern Xinjiang. As a consequence, cultural exchanges greatly increased, and Central Asian Buddhist missionaries became active shortly after in the Chinese capital cities of Loyang and sometimes Nanjing, where they particularly distinguished themselves by their translation work. They promoted both Hīnayāna and Mahāyāna scriptures. Thirty-seven of these early translators of Buddhist texts are known. Zhi Yao (c. 185), a Kushan monk in the second generation of translators after Lokakṣema. Bodhidharma (440–528), the founder of the Chan (Zen) school of Buddhism, and the legendary originator of the physical training of the Shaolin monks that led to the creation of Shaolin kung fu. According to the earliest reference to him, by Yang Xuanzhi, he was a monk of Central Asian origin whom Yang Xuanshi met around 520 at Loyang. Throughout Buddhist art, Bodhidharma is depicted as a rather ill-tempered, profusely bearded and wide-eyed barbarian. He is referred to as "The Blue-Eyed Barbarian" (碧眼胡:Bìyǎn hú) in Chinese Chan texts. Eastern Han inscriptions on lead ingot, using barbarous Greek alphabet in the style of the Kushans, excavated in Shaanxi, China, 1st-2nd century CE. The first documented translation of Buddhist scriptures into Chinese occurs in 148 CE with the arrival of the Parthian prince-turned-monk, An Shigao (Ch. 安世高). He worked to establish Buddhist temples in Luoyang and organized the translation of Buddhist scriptures into Chinese, testifying to the beginning of a wave of Central Asian Buddhist proselytism that was to last several centuries. An Shigao translated Buddhist texts on basic doctrines, meditation and abhidharma. An Xuan (Ch. 安玄), a Parthian layman who worked alongside An Shigao, also translated an early Mahāyāna Buddhist text on the bodhisattva path. Mahāyāna Buddhism was first widely propagated in China by the Kushan monk Lokakṣema (Ch. 支婁迦讖, active ca. 164–186 CE), who came from the ancient Buddhist kingdom of Gandhāra. Lokakṣema translated important Mahāyāna sūtras such as the Aṣṭasāhasrikā Prajñāpāramitā Sūtra, as well as rare, early Mahāyāna sūtras on topics such as samādhi and meditation on the buddha Akṣobhya. These translations from Lokakṣema continue to give insight into the early period of Mahāyāna Buddhism. From the 4th century onward, Chinese pilgrims also started to travel on the Silk Road to India, the origin of Buddhism, by themselves in order to get improved access to the original scriptures. According to Chinese sources, the first Chinese to be ordained was Zhu Zixing, after he went to Central Asia in 260 to seek out Buddhism. It is only from the 4th century CE that Chinese Buddhist monks started to travel to India to discover Buddhism first-hand. Faxian's pilgrimage to India (395–414) is said to have been the first significant one. He left along the Silk Road, stayed six years in India, and then returned by the sea route. Xuanzang (629–644) and Hyecho traveled from Korea to India. The most famous of the Chinese pilgrims is Xuanzang (629–644), whose large and precise translation work defines a "new translation period", in contrast with older Central Asian works. He also left a detailed account of his travels in Central Asia and India. 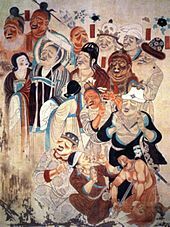 The legendary accounts of the holy priest Xuanzang were described in the famous novel Journey to the West, which envisaged trials of the journey with demons but with the help of various disciples. During the fifth and sixth centuries C.E., Merchants played a large role in the spread of religion, in particular Buddhism. Merchants found the moral and ethical teachings of Buddhism to be an appealing alternative to previous religions. As a result, Merchants supported Buddhist Monasteries along the Silk Roads and in return the Buddhists gave the Merchants somewhere to stay as they traveled from city to city. As a result, Merchants spread Buddhism to foreign encounters as they traveled. Merchants also helped to establish diaspora within the communities they encountered and over time, their cultures became based on Buddhism. Because of this, these communities became centers of literacy and culture with well-organized marketplaces, lodging, and storage. The Silk Road transmission of Buddhism essentially ended around the 7th century with the rise of Islam in Central Asia. Buddhism in Central Asia began to decline in the 7th century in the course of the Muslim conquest of Transoxiana. A turning point was the Battle of Talas of 751. This development also resulted in the extinction of the local Tocharian Buddhist culture in the Tarim Basin during the 8th century. The Silk Road transmission between Eastern and Indian Buddhism thus came to an end in the 8th century, on one hand because Islam in Central Asia repressed Buddhism along the Silk Road itself, but also because Buddhism in both India and China were in decline by that time. From the 9th century onward, therefore, the various schools of Buddhism which survived began to evolve independently of one another. The vigorous Chinese culture progressively absorbed Buddhist teachings until a strongly Chinese particularism developed. [clarification needed] In the eastern Tarim Basin, Central Asian Buddhism survived into the later medieval period as the religion of the Uyghur Kara-Khoja Kingdom (see also Bezeklik Thousand Buddha Caves), and Buddhism became one of the religions in the Mongol Empire and the Chagatai Khanate, and via the Oirats eventually the religion of the Kalmyks, who settled at the Caspian in the 17th century. Otherwise, Central Asian Buddhism survived mostly in Tibet and in Mongolia. Central Asian missionary efforts along the Silk Road were accompanied by a flux of artistic influences, visible in the development of Serindian art from the 2nd to the 11th century CE in the Tarim Basin, modern Xinjiang. 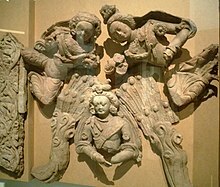 Serindian art often derives from the Greco-Buddhist art of the Gandhāra district of what is now Afghanistan and Pakistan, combining Indian and Greek influences. Highly sinicized forms of this syncretism can also be found on the eastern portions of the Tarim Basin, such as in Dunhuang. Silk Road artistic influences can be found as far as Japan to this day, in architectural motifs or representations of Japanese gods (see Greco-Buddhist art). The (5th century) Book of the Later Han, compiled by Fan Ye (398-446 CE), documented early Chinese Buddhism. This history records that around 65 CE, Buddhism was practiced in the courts of both Emperor Ming of Han (r. 58-75 CE) at Luoyang (modern Henan) and, his half-brother, King Ying (r. 41-70 CE) of Chu at Pengcheng (modern Jiangsu). The Book of Han has given rise to discussions on the maritime or overland transmission of Buddhism, and the origins of Buddhism in India or China. First, the Book of the Later Han biography of Liu Ying, the King of Chu, gives the oldest reference to Buddhism in Chinese historical literature. It says Ying was both deeply interested in Huang-Lao 黄老 (from Yellow Emperor and Laozi) Daoism and "observed fasting and performed sacrifices to the Buddha." Huang-Lao or Huanglaozi 黄老子 is the deification of Laozi, and was associated with fangshi "technician; magician; alchemist" methods and xian "transcendent; immortal" techniques. "To Liu Ying and the Chinese devotees at his court the "Buddhist" ceremonies of fasting and sacrifices were probably no more than a variation of existing Daoist practices; this peculiar mixture of Buddhist and Daoist elements remains characteristic of Han Buddhism as a whole." In 70 CE, King Ying was implicated in rebellion and sentenced to death, but Ming instead exiled him and his courtiers south to Danyang (Anhui), where Ying committed suicide in 71 CE. The Buddhist community at Pencheng survived, and around 193 CE, the warlord Zhai Rong built a huge Buddhist temple, "which could contain more than three thousand people, who all studied and read Buddhist scriptures." Second, Fan Ye's Book of Later Han quotes a "current" (5th-century) tradition that Emperor Ming prophetically dreamed about a "golden man" Buddha. While "The Kingdom of Tianzhu" section (above) recorded his famous dream, the "Annals of Emperor Ming" history did not. Apocryphal texts give divergent accounts about the imperial envoys sent to India, their return with two Buddhist monks, Sanskrit sutras (including Sutra of Forty-two Chapters) carried by white horses, and establishing the White Horse Temple. Since the Book of Later Han present two accounts of how Buddhism entered Han China, generations of scholars have debated whether monks first arrived via the maritime or overland routes of the Silk Road. The maritime route hypothesis, favored by Liang Qichao and Paul Pelliot, proposed that Buddhism was originally introduced in southern China, the Yangtze River and Huai River region, where King Ying of Chu was worshipping Laozi and Buddha c. 65 CE. The overland route hypothesis, favored by Tang Yongtong, proposed that Buddhism disseminated eastward through Yuezhi and was originally practiced in western China, at the Han capital Luoyang where Emperor Ming established the White Horse Temple c. 68 CE. The view that Buddhism was transmitted to China by the sea route comparatively lacks convincing and supporting materials, and some arguments are not sufficiently rigorous [...] the most plausible theory is that Buddhism started from the Greater Yuezhi of northwest India (present-day Afghanistan and Pakistan) and took the land roads to reach Han China. After entering into China, Buddhism blended with early Daoism and Chinese traditional esoteric arts and its iconography received blind worship. Zhang Qian noted only that: 'this country is hot and humid. The people ride elephants into battle.' Although Ban Yong explained that they revere the Buddha, and neither kill nor fight, he has recording nothing about the excellent texts, virtuous Law, and meritorious teachings and guidance. As for myself, here is what I have heard: This kingdom is even more flourishing than China. The seasons are in harmony. Saintly beings descend and congregate there. Great Worthies arise there. Strange and extraordinary marvels occur such that human reason is suspended. By examining and exposing the emotions, one can reach beyond the highest heavens. There is a current tradition that Emperor Ming dreamed that he saw a tall golden man the top of whose head was glowing. He questioned his group of advisors and one of them said: "In the West there is a god called Buddha. His body is sixteen chi high (3.7 metres or 12 feet), and is the colour of true gold." The Emperor, to discover the true doctrine, sent an envoy to Tianzhu (Northwestern India) to inquire about the Buddha's doctrine, after which paintings and statues [of the Buddha] appeared in the Middle Kingdom. Then Ying, the king of Chu [a dependent kingdom which he ruled 41-71 CE], began to believe in this Practice, following which quite a few people in the Middle Kingdom began following this Path. Later on, Emperor Huan [147-167 CE] devoted himself to sacred things and often made sacrifices to the Buddha and Laozi. People gradually began to accept [Buddhism] and, later, they became numerous. 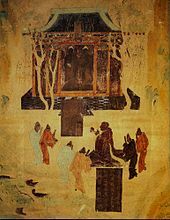 Mogao Caves 8th-century mural depicting the pseudohistorical legend of Emperor Wu of Han worshipping "golden man" Buddha statues. Despite secular Chinese histories dating the introduction of Buddhism in the 1st century, some apocryphal Buddhist texts and traditions claim earlier dates in the Qin dynasty (221-206 BCE) or Former Han dynasty (208 BCE-9 CE). But at night the prison was broken open by a Golden Man, sixteen feet high, who released them. Moved by this miracle, the emperor bowed his head to the ground and excused himself. The (668 CE) Fayuan Zhulin Buddhist encyclopedia elaborates this legend with Mauryan emperor Ashoka the Great sending Shilifang to China. With the exception of Liang Qichao, most modern sinologists dismiss this Shilifang story. 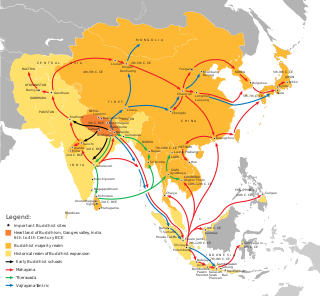 Some western historians believe Emperor Ashoka sent Buddhist missionaries to China, citing the (ca. 265) 13th Rock Edict that records missions to Greece, Sri Lanka, and Nepal. Others disagree, "As far as we can gather from the inscriptions he [Ashoka] was ignorant of the very existence of China." There is a Chinese tradition that in 2 BCE, a Yuezhi envoy to the court of Emperor Ai of Han transmitted one or more Buddhist sutras to a Chinese scholar. The earliest version derives from the lost (mid-3rd century) Weilüe, quoted in Pei Songzhi's commentary to the (429 CE) Records of Three Kingdoms: "the student at the imperial academy Jing Lu 景盧 received from Yicun 伊存, the envoy of the king of the Great Yuezhi oral instruction in (a) Buddhist sutra(s)." Since Han histories do not mention Emperor Ai having contacts with the Yuezhi, scholars disagree whether this tradition "deserves serious consideration", or can be "reliable material for historical research". In olden days emperor Ming saw in a dream a god whose body had the brilliance of the sun and who flew before his palace; and he rejoiced exceedingly at this. The next day he asked his officials: "What god is this?" the scholar Fu Yi said: "Your subject has heard it said that in India there is somebody who has attained the Tao and who is called Buddha; he flies in the air, his body had the brilliance of the sun; this must be that god. Academics disagree over the historicity of Emperor Ming's dream; Tang Yongtong sees a possible nucleus of fact behind the tradition, and Henri Maspero rejects it as propagandistic fiction. Exemplifying how traditional accounts of Chinese Buddhism sometimes combined history and legend, the Book of Han records that in 121 BCE, Emperor Wu of Han sent general Huo Qubing to attack the Xiongnu. Huo defeated the people of prince Xiutu 休屠 (in modern-day Gansu) and "captured a golden (or gilded) man used by the King of Hsiu-t'u to worship Heaven." Xiutu's son was taken prisoner, but eventually became a favorite retainer of Emperor Wu and was granted the name Jin Midi, with his surname Jin 金 "gold" supposedly referring to the "golden man." The golden statue was later moved to the Yunyang 雲陽 Temple, near the royal summer palace Ganquan 甘泉 (modern Xianyang, Shaanxi). ^ "These two Sanskrit terms, given in the Chinese text in phonetic transcription, refer to lay adepts and to Buddhist monks, respectively"; and show detailed knowledge of Buddhist terminology. 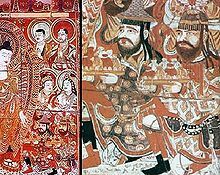 ^ The (8th century) fresco discovered in the Mogao caves (near Dunhuang in the Tarim Basin) that depicts Emperor Wu worshipping two Buddhist statues, "identified as 'golden men' obtained in 120 BCE by a great Han general during his campaigns against the nomads". Although Emperor Wu did establish the Dunhuang commandery, "he never worshipped the Buddha." ^ Zürcher (1972), pp. 22–27. ^ Oscar R. Gómez (2015). Antonio de Montserrat - Biography of the first Jesuit initiated in Tibetan Tantric Buddhism. Editorial MenteClara. p. 32. ISBN 978-987-24510-4-2. ^ Loewe (1986), pp. 669–670. ^ Tai Thu Nguyen (2008). The History of Buddhism in Vietnam. CRVP. pp. 36–. ISBN 978-1-56518-098-7. Archived from the original on 2015-01-31. ^ Broughton, Jeffrey L. (1999), The Bodhidharma Anthology: The Earliest Records of Zen, Berkeley: University of California Press, ISBN 0-520-21972-4. pp. 54-55. ^ Jerry H. Bentley, Old World Encounters: Cross-Cultural Contacts and Exchanges in Pre-Modern Times (New York: Oxford University Press, 1993), 43-44. ^ Jerry H. Bentley, Old World Encounters: Cross-Cultural Contacts and Exchanges in Pre-Modern Times (New York: Oxford University Press, 1993), 48. ^ Zürcher (1972), p. 26. ^ Zürcher (1972), p. 27. Compare Maspero (1981), p. 405. ^ Tr. by Zürcher (1972), p. 27. ^ Demiéville (1986), p. 821. ^ Zürcher (1972), p. 28. ^ Rong Xinjiang, 2004, Land Route or Sea Route? Commentary on the Study of the Paths of Transmission and Areas in which Buddhism Was Disseminated during the Han Period, tr. by Xiuqin Zhou, Sino-Platonic Papers 144, pp. 26–27. ^ Tr. by Hill (2009), pp. 56–57. ^ Zürcher (1990), p. 159. ^ Hill (2009), p. 31. Compare the account in Yang Xuanzhi's (6th-century) Luoyang qielan ji 洛陽伽藍記, tr. by Ulrich Theobald. ^ Zürcher (2007), p. 20. ^ Saunders (1923), p. 158. ^ Williams (2005), p. 57. ^ Tr. by Zürcher (2007), p. 24. ^ Draft translation of the Weilüe by John E. Hill (2004) The Peoples of the West. ^ Zürcher (2007), p. 25. ^ Demieville (1986), p. 824. ^ Zürcher (2007), p. 22. ^ Zürcher (2007), p. 14. ^ Tr. by Henri Maspero, 1981, Taoism and Chinese Religion, tr. by Frank A. Kierman Jr., University of Massachusetts Press, p. 402. ^ Tr. Dubs (1937), 4-5. ^ Zürcher (2007), p. 21. ^ Whitfield et al (2000), p. 19. Demieville, Paul (1986). "Philosophy and Religion from Han to Sui", in The Cambridge History of China: Volume I: the Ch'in and Han Empires, 221 BC. – AD. 220. Edited by Denis Twitchett and Michael Loewe. Cambridge University Press. Pp. 808–873. Draper, Gerald (1995). The contribution of the Emperor Asoka Maurya to the development of the humanitarian ideal in warfare. International Review of the Red Cross, No. 305. Dubs, Homer H. (1937). The "Golden Man" of Former Han Times. T'oung Pao 33.1: 1-14. Michael C. Howard (23 February 2012). Transnationalism in Ancient and Medieval Societies: The Role of Cross-Border Trade and Travel. McFarland. ISBN 978-0-7864-9033-2. Loewe, Michael (1986). "The Religious and Intellectual Background", in The Cambridge History of China: Volume I: the Ch'in and Han Empires, 221 BC. – AD. 220, 649–725. Edited by Denis Twitchett and Michael Loewe. Cambridge University Press. Richard H. Robinson; Sandra Ann Wawrytko; Ṭhānissaro (Bhikkhu.) (1996). The Buddhist Religion: A Historical Introduction. Wadsworth Publishing Company. ISBN 978-0-534-20718-2. Saunders, Kenneth J. (1923). "Buddhism in China: A Historical Sketch", The Journal of Religion, Vol. 3.2, pp. 157–169; Vol. 3.3, pp. 256–275. Tansen Sen (January 2003). Buddhism, Diplomacy, and Trade: The Realignment of Sino-Indian Relations, 600-1400. University of Hawaii Press. ISBN 978-0-8248-2593-5. Whitfield, Roderick, Whitfield, Susan, and Agnew, Neville (2000). Cave temples of Mogao: art and history on the silk road. Getty Publications. Williams, Paul (2005). Buddhism: Buddhist origins and the early history of Buddhism in South and Southeast Asia. Taylor & Francis. Zürcher, Erik (2007). The Buddhist Conquest of China, 3rd ed. Leiden. E. J. Brill. 1st ed. 1959, 2nd ed. 1972. Zürcher, E. (1990). "Han Buddhism and the Western Region", in Thought and Law in Qin and Han China: Studies Dedicated to Anthony Hulsewe on the Occasion of His Eightieth Birthday, ed by W.L. Idema and E. Zurcher, Brill, pp. 158–182.